What’s even worse: Most of those affected Android devices will probably never be patched. That’s a very big number. The four security vulnerabilities are:CVE-2016-2503 discovered in Qualcomm’s GPU driver and fixed in Google’s Android Security Bulletin for July 2016. Qualcomm is the world’s leading designer of LTE (Long Term Evolution) chipsets with a 65% share of the LTE modem baseband market. If any one of the four flaws is exploited, an attacker can trigger privilege escalations for gaining root access to an affected device. 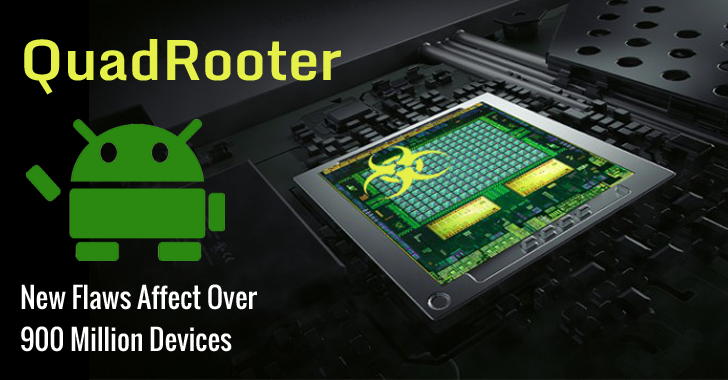 Here’s the list of some of the popular affected devices, though there are far more devices that are impacted by one or more Quadrooter vulnerabilities. Since the vulnerable software drivers, which control communication between Qualcomm chipset components, come pre-installed on these devices at the time of manufacturing, they can only be fixed by installing a patch from the devices’ distributors or carriers after receiving fixed driver packs from Qualcomm. Three of the four vulnerabilities have already been fixed in Google’s latest set of monthly security updates, and a patch for the remaining flaw will be rolled out in the upcoming September update.